Climate change will alter forest ecosystems and their provisioning of services. Forests in the Carpathian Mountains store high amounts of carbon and provide livelihoods to local people; however, no study has yet assessed their future long-term dynamics under climate change. Therefore, we selected a representative area of 1340 km2 to investigate the effects of changing climate and disturbance regimes on (i) the spatial dynamics of the dominant tree species and forest types and (ii) the trajectories of the associated aboveground live carbon (ALC). We simulated 500 years of change under four Representative Concentration Pathway (RCP) scenarios, incorporating wind and bark beetle disturbances using the LANDIS-II forest change model. Our simulations revealed a lagged adaptation of the forest landscape to climate change. While Picea abies dominance declined in all scenarios, Carpinus betulus expanded at low elevations and Acer pseudoplatanus at mid-elevations. We also found a slow but continuous expansion of Quercus petraea and Q. robur at low elevations and of Fagus sylvatica at mid and high elevations. 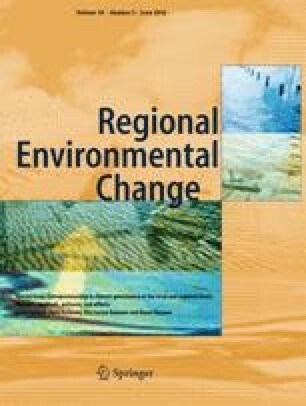 This change in species composition was accompanied by a significant reduction of ALC: on average over the simulation period, unmitigated climate change reduced ALC between − 2.1% (RCP2.6) and − 14.0% (RCP8.5), while disturbances caused an additional reduction of ALC between − 4.5% (RCP2.6) and − 6.6% (RCP8.5). Therefore, foresighted management strategies are needed to facilitate vegetation adaptation to climate change, with the goal of stabilizing carbon storage and maintaining economic value of future Carpathian forests. The online version of this article ( https://doi.org/10.1007/s10113-018-1296-8) contains supplementary material, which is available to authorized users. This paper is part of a larger project initiated by Garry Sotnik to introduce LANDIS-II to the Ukrainian Carpathians for the study of human adaptation to climate change. We are grateful to Garry Sotnik for organizing the team and raising funding for the Ukrainian team members. We would also like to thank two anonymous reviewers for very helpful remarks, which led to the significant improvement of this paper.